Whether it is a hay trolley, hay unloader, hay pulley or hay lifter, there is a very good chance it’s all the very same thing. Hay trolleys represent a remarkable part of American history, one that is only now being fully understood and appreciated. For most of America’s history we were primarily an agricultural nation. The vast majority of Americans worked in some capacity on farm production, transportation, storage or sales. This was the case from the earliest 1600’s, long before the revolution, to right up until the 1940’s when, for the first time, other industries grew larger. Hay trolleys came about in a remarkable period of innovation right at the end of the American Civil War (1860-1864) and at the beginning of what would be known as the “second industrial revolution.” America came out of the civil war with enormous industrial capabilities, the best minds in industry were asking themselves what they should do with all the new foundry and manufacturing strength. The answer was, in part, to produce some of the very first commercial products and sell them to the largest segment of the economy, agriculture. 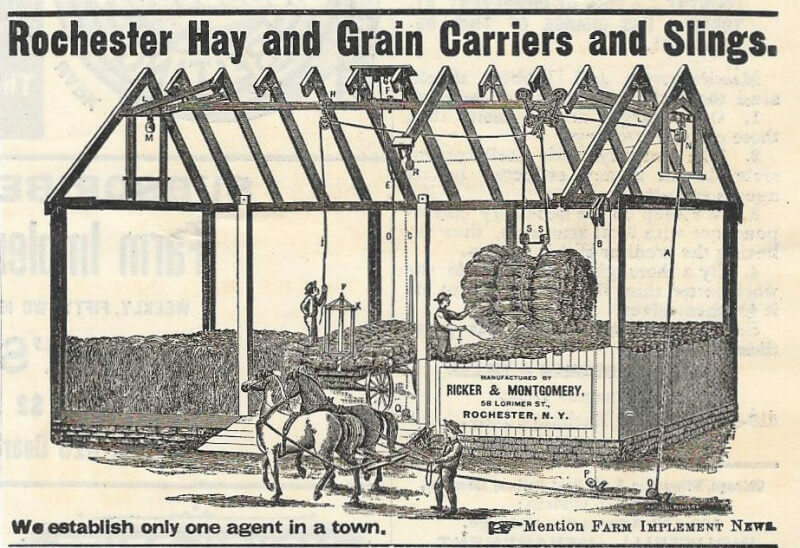 Thus, starting in and around 1860 and running for close to 80 years, a huge number of patents and products were targeted at getting farmers to become “modernized.” Hay trolleys played a principle and early role in this. The work of many men could be done in far less time by the use of hay trolleys. During this very same period we also come to see some of America’s earliest forms of marketing, sales literature, advertisement, distribution networks, franchised products, brand labeling and a whole host more. Hay trolleys are arguably America’s very first form of “robots” ever produced and sold to the public to do real work. Trolleys could be “programmed” to perform very specific and directed functions. By the use of trips, triggers, tracks, knockers, lines and “switches,” trolleys could be made to stop, lock, release, drop, remain, receive, release, and travel all at specific times and to a specific direction. If that isn’t already enough, hay trolleys are also a magnificent example of craftsmanship and industrial art. Rarely do we find such beauty in something used so heavily in a typical American homestead. So what are Hay Trolleys? Well, lets start with the basics, lets start by looking at typical designs and terminology. The earliest hay trolleys looked very much like this example of a Rundle Hay Trolley from the late 1870s, and later ones can look like the Myers below it. Early hay trolleys use a single “Center Drop Pulley (cdp)” that would have a “hay spear” attached to them. We refer to all such arrangements…one center drop pulley with a spear attachment….as “Hay Fork” trolleys. Depending on the type of fork one attached to the bottom, one could pull up varied amounts of hay and move it to be dropped in the right part of the barn. These “Hay Fork” trolleys have a number of important characteristics, some of them we find with all trolleys. In the case of a “Hay Fork” Trolley, they all have to have their cdp pulled all the way up so that the cdp can lock into the receiver on the car. But farmers wanted to move greater quantities of hay. They really wanted to move the whole hay wagon in one fell swoop! To do this designers began by creating even more massive hay forks, huge racks that would lift a whole wagon’s worth, but it wasn’t safe or reliable. So the designers set about to create “Hay Sling” trolleys that would be able to hook on to huge nets that were laid on top of the hay wagon before it was loaded. Hundreds of styles of hay nets were sold. If you look at the pictures of these hay nets you will see that they have special releases right in the very center of the net. The farmer would pull a release line and they would come apart dead-center, dumping the whole load exactly where needed and perfectly spread out. In order for a farmer to use a hay net he now needed two drop pulleys. Many farmers didn’t want to pay the money for the coming new style “Hay Sling” trolleys. Knowing that, the manufacturers made conversion kits for the old style “Hay Fork” trolleys. The farmer would replace the center drop pulley with a new pulley system called “interlocking hay sling sets.” These still required the load to be lifted all the way up to the trolley to lock-in and trigger the trip to move. Many farmers wanted the strength and huge lifting capacities of the new generation of “Hay Sling” trolleys. These were the “Iron Giants” of the hay trolley era and represent some of the most powerful and most complex designs produced. Now, lets take a look at how and where all the trolleys went to work. Like most farm equipment and implements, hay trolleys made farm work far easier. Before their invention, farmers hauled hay from the fields on wagons and pitched it by hand into huge hay stacks. These were simply enormous piles, which left hay exposed to the elements. Sometime about 1860, hay trolleys were first introduced. The earliest hay trolleys moved hay from wagons to outside haystacks. Those trolleys ran along metal cables or steel rods strung between tall, wooden tripods on each end of the stack. The hay trolleys all ran on “cable” and are referred to by some collectors as “cable runners”. We can quickly identify them as they almost all have only two wheels on top, though some have three in a row. The style and function of hay trolleys changed when barns became more popular. Here we find the farmer bringing hay to the barn on huge hay wagons and using trolleys to move it within the barn to the “mow.” The first barn-designed trolleys traveled along 2-by-4-inch or 4-by-4-inch wooden beams. Wood beam or “timber runners” generally represent early hay trolleys. There are literally 100’s of designs that come into and out of production. We generally can identify them as timber, which requires that the top wheels are wider than those we find on later steel track models. Below we can see some timber models running along the highest point in the barn. Let’s really explore the right hand picture of the barn below. All the parts and pieces are there to be seen in either picture, but we will label the right hand one. The horse “I” pulls on the line that goes through two more pulleys “H & G” before it crosses the barn “C’ and goes through the rope sheave (rope wheel) of the trolley “F” and through the center drop pulley “E.” Although you can’t see it, the rope has a tie-off on the trolley on the other side pretty much under the “D.” If you look carefully, the trolley “B,” has gotten its center drop pulley pulled all the way up and it is locked into the trolley. This must have occurred after the center drop went down with its Hay Fork “J” and speared a big load of hay in the wagon below. But we are not done, what the picture really doesn’t show is that there was a trip on the beam that held the trolley there and let that center drop pulley go down. And, only when that center drop pulley locks back into the trolley will the trip let the hay move LEFT in the barn all the way to the “G” wall pulley. At that point the man holding the line “K” will pull it and the hay will fall were the man with the pitch fork can be seen in the left part of the barn. So…how does the trolley more back to the center of the barn when the hay has been dropped? Easy and automatically! See the weights “O” hanging at the end of the return line “L” that runs through “M” and all the way back “A” to the trolley? Well that weight “O” will come back down (it was pulled up when the trolley went LEFT) and pull the trolley from the LEFT side of the barn to the center where the trip will grab it and release the center drop to go down for more hay. If one looks closely at the picture below, one can see the farmer on the wagon that came from the field. One can also see the horse outside the front barn door walking away with a line attached all the way back and up to the trolley. That line goes through a series of pulleys on the ground, or floor, or wall(s) of the barn before it goes up to the trolley. 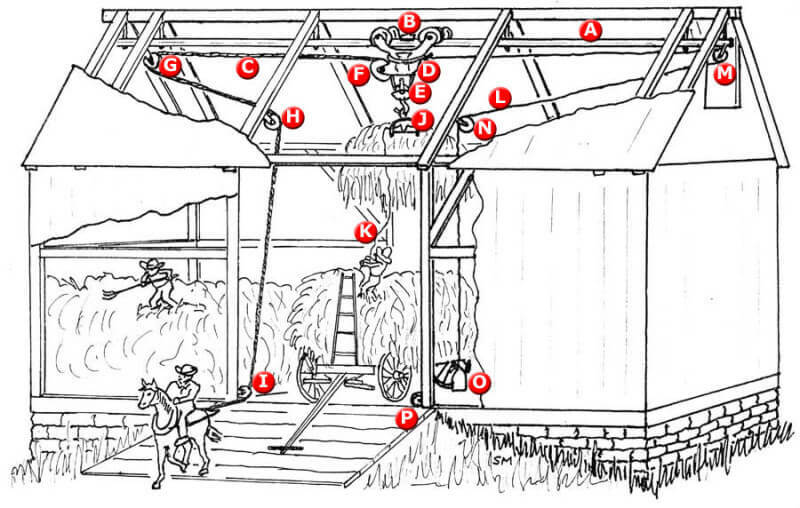 Also notice that the farmer standing on the hay wagon has a “trip” or “trigger” line in his hand that will activate a latch on the hay spear that is attached to the bottom of the center drop pulley of the hay trolley. When the hay is moved to the mow position near the farmer with the pitch fork, the farmer will pull that line and release all the hay to drop into the mow. Steel rails replaced the wooden beams around 1890 because steel was far sturdier and able to hang off of the barn structure simply. That’s when trolleys began to take on their familiar design, with small, steel wheels that moved the device along a track high above the barn floor. Steel-track trolleys were generally smaller, lighter and easier to return to position when empty. At this point, hay trolleys were so articulated they could automatically open barn doors to come outside the barn and retrieve their payload. Besides different makers and overall shapes, trolleys are most distinguished by their complex trip or knocker designs that activated the mechanism as it moved hay into the barn. The latches and accompanying triggers were so unique that most trolley patents are based on the design of those integral components. Latches were made for two functional types of trolleys. One latch was designed for use with hayforks and one with hay slings – both tools that farmers relied on to hoist hay into high barn lofts. Trolley makers had the greatest impact on barn designs than any other tool in the barn. So great was the need to properly plan your barn to use a complete hay trolley system with all its trips and triggers that trolley manufactures sold or even gave for free the best barn designs in the nation. Buy one brand’s trolley and you could get a whole new set of plans for your next barn!